You are here: Home / English / Historical / Is the Theology of the Assyrian Church Nestorian? Is the Theology of the Assyrian Church Nestorian? This paper was originally given at the First Non-Official Consultation on Dialogue within the Syriac Tradition, held in Vienna between June 24th – 29th 1994 under the auspices of the Pro Oriente Foundation. It was later published in the record of proceedings of the Consultation and edited on behalf of the Pro Oriente Foundation by Alfred Stirnemann and Gerhard Wilflinger. His Beatitude Mar Aprem is the Metropolitan of Malabar and India. The Metropolitan holds a Master of Theology from the United Theological College (Serampore, 1966) and a Master of Sacred Theology from Union Theological Seminary (New York, 1967). He later undertook postgraduate theological studies graduating with a Doctorate of Theology from Serampore University (1976). He completed and was admitted to the degree of Doctor of Philosophy in Syriac by Mahatma Gandhi University in 2002. His Beatitude has also been a student at St Boniface College (Warminster, England), St Augustine’s College (Canterbury, England) and at the Ecumenical Institute (Bossey, Switzerland). His Beatitude has published almost 70 books and numerous monographs largely focused on church history, theology, biographies and travelogues in both English and Malayalam. 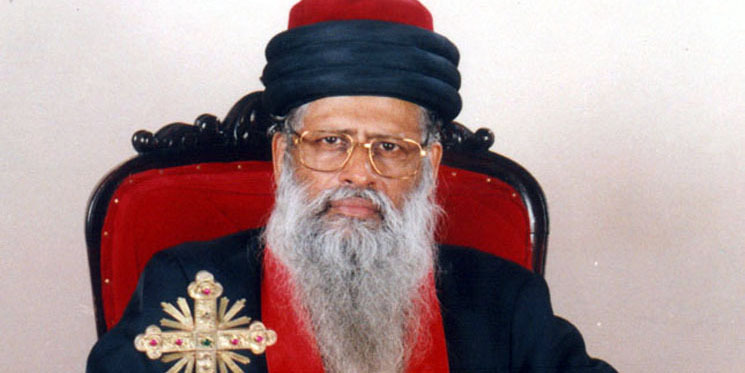 Since his consecration as Metropolitan in Baghdad in 1968 His Beatitude has been intimately active in the ecumenical movement both in India and abroad. This has included ecumenical dialogues via the Pro Oriente Foundation (Vienna, Austria) and other bi-lateral theological consultations. He was previously co-chairman of the Joint Committee for Theological Dialogue between the Catholic Church and the Assyrian Church of the East. Most recently, a second edition of His Beatitude’s PhD dissertation entitled The Assyrian Church of the East in the Twentieth Century (Kottayam: SEERI, 2003) has been published. The question whether the Theology of the Church of the East (known as the Assyrian Church, East Syrian Church or the Nestorian Church) is Nestorian has been debated in the present century by some individual scholars. One problem in finding a suitable answer to this question is the difference in understanding the word Nestorian. The Churches who accept the council of Ephesus of 431AD presided over by Cyril of Alexandria consider Nestorianism as a heresy because they thought that Nestorius taught two personalities in Jesus Christ and Jesus was born as a human being to Whom divinity was joined later at the time of baptism or so. But the truth is that Nestorius did not teach any such heresy. He believed like all bishops in his time that Christ was God and Man. How exactly was this union of two nature, divinity and humanity in Christ, united in one person in Christ, this was the burden of the council of Chalcedon twenty years after the council of Ephesus of 431AD. The Church of the East does not recognise the council of Ephesus presided over by Cyril of Alexandria. The history of the two rival councils held at Ephesus in June 431AD is ery complicated and unfortunate. The anathematisms and counter-anathematisms have been discussed by the present writer in his M.Th. Thesis submitted to the Senate of Serampore in 1966 (Published by Mar Narsai press, Trichur, Kerala, India in 1978). A short evaluation of the Council of Ephesus of 431AD would bring us to the conclusion that the Council of Ephesus of 431AD was guided also by the personal enmity of Cyril against Nestorius, rather than the Christological issue which was evidently the cause according to the “official version.” Moreover, the help of the Pope of Rome given to Cyril resulted in the ultimate victory. the validity of the Synod of Ephesus of 431AD as an ecumenical Council of the universal church and its subsequent acceptance by the Church of the East remains doubtful. The reasons for the refusal of recognition to this Council by the Church of the East are many. The Church of the East was neither invited nor present in this Council. The Council of Cyril was declared null and void, as per the oder of the Imperial Commissioner in June 431AD and the repeated orders of the Emperor till the “political” settlement, and such a settlement did not affect the Persian Church as it was beyond the jurisdiction of Theodosius II. Moreover, the Council of Cyril did not settle any issue, but, on the contrary, created more problems as seen the Eutychian heresy which was a development of the mia physis thought of Cyril of Alexandria. Aoart from the dangerous use of the ambiguous title Theotokos, the Christology of the Church of the East was much similar to that of the Council of Chalcedon, two decades later. These factors demand a change of outlook by the other churches in regard to the recognition of the council of Ephesus of 431. Individuals have come out with statements in sympathy with, and in favour of, the stand of the Church of the East. Adolf Harnack and many others challenged the propriety of calling the Council of Ephesus the ecumenical council. The French Roman Catholic theologian, Pére J. Mahe, who made a fresh examination of the writings of Theodoret, was led to the conclusion that the two Christologies of Antioch and Alexandria, in spite of notable differences, were alike perfectly orthodox. If Theodoret, who wrote against the twelve anathematisms of Cyril against Nestorius, was considered orthodox in the Council of Chalcedon, Nestorius also would have been considered orthodox if he had been present. What is required is not individual opinions, but official statements by the Churches. Donald Baille argues that if the human nature of Jesus Christ lacks a human person (a human centre, subject and principal of identity) it is incomplete. Cyril C. Richardson in his article “A Preface to Christology,” states that only Nestorians can answer the question “Wherein lies the reality of Jesus’ temptation? Wherein is His human freedom?” The Christology of the Church of the East is relevant to modern times because of its teaching of perfect human nature. The Nestorian Christ is one who was subject to the conditions of life of the first century, tempted, triumphant and obedient and thereby being a perfect example to mankind of every nation for all times. The necessity for a “Nestorian” Christology becomes inevitable when we think of the greatest position ascribed to Virgin Mary in the Roman Catholic Church. The fear expressed by Nestorius against the use of Theotokos should not be ignored. It is one of the positive contributions of Nestorius to have exposed the ptoential danger of this title. As far back as our records of history go there was nobody to speak against this title before 428AD though it was used by certain individuals. Perhaps it would have become the standard expression of all Christians if Nestorius did not wage such a crusade against this title. Till the Reformation in the 16th century, the Church of the East was the only Church which shared the concern of Nestorius against the use of Theotokos. Since the Reformation, however, many churches share this attitude and thus the position taken by the Church of the East singularly, down through the centuries, is vindicated. In these days, when the announcement such as the “Immaculate Conception of Mary,” Assumption of Mary to Heaven, Proclaiming Mary as the Queen of Heaven, are made, the Christians have begun to open their eyes to the dangers of the over-emphasis of the imprtance of Mary. The opposition to excessive Mariology demonstrated at the Vatican II and the opposition to a seperate Schema on Mary from many bishops at the Council show that even in the Roman church some at least are beginning to see the dangers of the title of Theotokos. Therefore, the position explained by Nestorius and consistently maintained by the Church of the East, deserves the appreciation of Christians. Now many protestants have reocognised that the fears expressed by Nestorius against the use of the title Theotokos were genuine. This justifies the stand that the “Nestorian” Christology is relevant for today. The “Image of Nestorius” has changed considerably in the recent years. Bethune Baker proved that Nestorius was not a Nestorian! Wigram could see the Christological formula of the Church of the East as free from any charges of heresy. F. Loofs, who did not give much importance to the “transactions of Ephesus” of 431, showed considerable sympathy to Nestorius and his Christology. Against the charge of dualism in Nestorianism, he argued that Nestorius emphasised the unity of the Person of Christ. A.R. Vine, who felt it impossible to comprehend the meaning of the Christology of Bazaar of Heracleides, without a “metaphysical and Christological system” endeavoured to formulate a system by “working backwards and forwards,” and claimed to have succeeded in the “evolution of a self consistent metaphysics and Christology.” He reached the conclusion: “There are elements in the thought of Nestorius which provide a helpful mode of approarch to the Christological problem.” At present many take a position, which was long ago taken by Mosheim even before the “discovery” of the Bazaar, that “Nestorianism” is an error in words rather than in thought. The present writer has gone a step furhter. The Christology of the Church of the East, as well as that of Nestorius himself, is not far from the Chalcedonian formula. Though the words are different the teaching is very much the same. The Christology of Chalcedon is Antiochene in emphasis. In other words, the Chalcedonian formula was the triumph of Nestorian Christology. One phrase which has caused some perplexity, that which asserts that there are in Christ one parsopa (prosopon), two qnome, and two natures. The word qnoma is equivalent of “Hypostasis” and if used in the later sense of that word, i.e. as meaning “person,” it would imply real Nestorianism; but research had made it plain that it is used in the earlier sense of “hypostasis,” namely, “substance,” and this makes the phrase, if redundant, at least perfectly, orthodox. While the Lambeth Conference Report of 1948 expressed the hope that the relations between these two churches may be strengthened, the report of 1958 mentioned only the political and material aspets of the Assyrian Church. It does not mean that the Assyrian Church is in disagreement with the doctrinal position explained in 1911 statement. Neither does it mean that the Anglican church had “Second thought.” The council of Foreign Relations of the Church of England at Lambeth agrees with this view. A word is necessary on the position of the Council of Chalcedon in the Church of the East. Monseigneur Chabot deserves the credit for the information that Synodicon Orientale included the Council of Chalcedon and “Tome of Leo” as officially accepted by the Church of the East. Though he did not print the texts of these documents in the edition, his announcement that these documents were approved documents of the Church of the East took the scholary world by surprise. Wigram who took pains to investigate this question, was able to find the manuscript of Synodicon Orientale in Mosul and happened to see the formula of Chalcedon in it. The Church which recognises the formula of Chalcedon deserves the recognition of the western Churches. The Church of England took a right step in proper direction. As far as the Assyrian Church of the East is concerned, it will never forsake their hero. The Protestant Church, which do not accept the title “Theotokos” though used in the Council of Ephesus of 431 ought therefore to say officially whether they regard the approval of the condemnation of Nestorius by Cyril and his followers as a necessary test of orthodoxy. The Anglican scholars expressed their willingness to accord official recognition to the Church of the East without insisting u[on the condemnation of the three Greek doctors, provided they cease to repeat the anathema on Cyril of Alexandria. It is extremely unlikely that the Church of the East will cease to mention the names of the three Greek doctors in their Litany. Wigram suggested to use an alternate bidding found in the litany to avoid the names of the Greek doctors with the hope that “the change would not be felt, as the people are all the while occupied in singing an anthem.” Whether the change will be felt or not, the Church of the East will never agree to any “change” in this matter. A change of attitude of other churches in regard to their recognition of the Council of 431AD will pave the way for the reunion of this once far-reaching Church which is the first major schism of the Christendom. The prospects of a “Nestorian” Christology are much brighter today than ever before. The Protestant theologians who have begun to emphasise the reality of the suffering of Christ, as an example of his perfect humanity, can play a part in it. The present writer has gone further than the previous students of Nestorianism in suggesting without hesitation that Bazaar of Heracledies answers most of the charges levelled against Nestorius. The results of the Arrhus consultation of August 1964, in a way, are discouraging, if a unilateral declaration of a Christological compromise is made from the East, they may have to go its own way and the “Church of the East” may find more affinity with the West than the East from the christological point of view. If the “eastern ecumenism” is based on Cyril of Alexandria and the Council of Ephesus “western ecumenism” will be based on the Tome of Leo and the Council of Chalcedon. As the non-Chalcedonian Churches insist on the reunion with the orthodox Churches without recognising the Council of Chalcedon of 451AD, the Church of the East has a legitimate claim to insist on the reunion without recognising the Council of Ephesus of 431AD, presided over by Cyril. Even Cyril treated the decision of the Council of 431 with such a scant respect that within two years he swept that decision absolutely on one side, and made, on his own authority, a compromise with his rivals. It is possible for the churches to follow the example of Cyril and to rethink the importance they have attached to this as the third ecumenical council – an idea, which perhaps did not occur ever to Cyril. The present writer had claimed his M.Th. Thesis to be an impartial study of the Council of Ephesus. Impartiality, however, does not consist in refusing to form any opinion or in a futile concealment of the dangers of the thought of the man concerned, but in treating them scientifically and sincerely and attempting to discover objectively the thought in the historical background in which it was developed. This, then, the present writer hopes to achieve in this consultation. Men have thought about all the conceivable forms of the conception of the union of the divine and human natures of Christ. How exactly has this union taken place? It is open to conjectures. To a certain extent, it is beyond human speculation. The “re-discovery” of the Bazaar was a “dispensation of God, in an age in which the doctrine of the Incarnation is exposed to dangers from opponents and defenders alike which are at least as dissolvent as those against which he cried unheard.” Modern thought can best profit from this controversy by attempting a synthesis of the apparently opposed but really complementary views. The christology of the Church of the East, i.e. one person, two qnome and two kyane, when it is translated as one person, two concrete natures and two abstract natures, is perfectly orthodox. As A.R. Vine has pleaded we should give Nestorius the benefit of doubt with regard to the technical terms. If we attempt to understand exactly how Godhead and manhood are united in the one person Jesus Christ, we reach the inevitable conclusion that the problem of Christology is insoluble. In understanding the qnoma, this writer rejects the translation given by some scholars as person and puts forward an alternative view that it should be understood as “the individuated nature” or concrete nature, if the word kyana (nature) is understood as “abstract nature.” Qnoma is also translated in this thesis as hypostasis. This is done so because several other writers have done likewise; for instance, in their useful work “A Nestorian Collection of Christological Texts,” Luise Abramowski and Alan Goodman translate the word as hypostasis. But hypostasis does not convey the true meaning of qnoma as used by Nestorian Fathers. The present writer is of the opinion that some better word could be coined in order to convey the true meaning which the members of this Church attributed to this controversial, but crucial, term qnoma. This writer does not argue that this Christology, even if it is understood properly, agrees completely with the Christological formula of the Council of Chalcedon AD 451 though the Nestorian Christology has several points of agreement with Tome of Leo, as Nestorius himself has claimed, over against his opponent Cyril of Alexandria, the observations made by V.C. Samuel, quoted in the present writer’s D.Th. dissertation, give us a new direction to explore further the points of agreement between Cyril’s Christology and the Christology of Nestorius. Though this Church considers Nestorius as a saint, this is not a Church founded by Nestorius. Nestorius did not know Syriac and the East Syrian Church of the Persian empire know no Greek. There was no contact between the East Syrian Churches of Persia and the “heretic” and his supporters in AD 431. Only after the death of Nestorius, when the East Syrian Church had not part in the Christological battles between Nestorius and Cyril, nor had any knowledge of this unhappy controversy during the life time of the champions, has been unjustly described as the Church founded by Nestorius. The separation of the East Syrian Church from the rest of the Christendom and particularly from the jurisdiction of Antioch had taken place before the Christological controversy had sprung up in AD 428. A canon of the Synod of Dadisho’ in AD 424 forbade the bishops of this Church to have any ecclesiastical jurisdictional contact with the West. This fact itself leads us to the conclusion that the separation of the East Syrian Church was motivated by political, cultural, linguistic or personal considerations rather than any theological reason for there was none such existent in AD 424. The important Pauline ideas of self-emptying, image of God, form of servant, historical Jesus etc., have been founded in Nestorius too. It was from his biblical foundation Nestorius formulated his theory of prosopic union. The Christological formula of this Church is that of the prosopic union rejecting the formula of hypostatic union accepted by both Catholics and the Eastern Orthodox Churches (Greek, Russian etc.). This prosopic union is a three tier Christology where the union is not at the first level of natures, nor at the second level of the hypostases but at the third level of the prosopon. To the members of this Church, the idea of perfect God and man is understood only if Christ has both natures and qnome of both God and man and the union has taken place only at the level of prosopon. As for the Mariology, it refuses to call Mary “Theotokos” unlike the Orthodox Church. However, this writer believes that despite the refusal to use the title Theotokos to the Blessed Virgin Mary, the “Nestorian” Churches throughout the world, is in general agreement with the Eastern Orthodox and the Oriental Orthodox (non-Chalcedonian) Churches in giving respect and veneration to the Blessed Virgin Mary. A Nestorian is an orthodox without theotokos. This Church does not overdo the respect due to Mary as the Roman Catholics seem to do, nor does it underestimate the honour due to the Blessed Virgin Mary as some of the Protestant Churches have admittedly done. The prayers of this Church about Virgin Mary would lead to the inevitable conclusion that this Church tries to give a proper place to the Blessed Virgin Mary avoiding the excesses and at the same time trying to save the Church from the danger of ignoring the Mother of our Lord and Saviour, Jesus Christ. In this context, it must be stated further that nobody in this Church as never questioned the Virgin Birth, as some modern theologians in various Churches do today. She is ever virgin before, in and after the birth of Jesus Christ. The special emphasis of the Nestorian Christology on the humanity of our Lord is the statement that in jesus Christ there are two distinct qnome, divine and human. This emphasis on the humanity of the Saviour of the mankind saved the Church in the fifth century from the heresy of the followers of Apollinarius who were still in the capital city of Constantinople where Nestorius worked as the head of the Church during the period AD 428-31. This emphasis on humanity is generally recognised today in the contemporary theological debate throughout the world. The East Syrian Church therefore, the present writer hopes, will have a definite contribution to make in the development of a Christian theology utilising the initiatives provided by some emerging dynamics in the religious and cultural context in the world today. By the denial of the title Imme d’Alaha (Mother of God) the Assyrian Church never denied the divinity of Jesus Christ. They believed like all fathers of the Council of Nicea 325AD and the Council of Constantinople 381AD that the expressions used in those Councils and the Nicene creed are good enough to guarantee the divinity of Jesus Christ. Imme D’Msheha (Mother of Messiah) is proper expression as all Christians believe that Messiah is perfect God and perfect man. Is the theology of the Assyrian Church Nestorian? The answer is both Yes and No. If Nestorius himself was never a Nestorian, why should anybody bother whether the reply is Yes or No? It is “Nestorian” to the extent that the Assyrian Church considers him a Saint and Greek doctor (Malpana Yawnaya) of the Church. The answer is “No” if the questioner thought that Nestorianism is the denial of the divinity or the total separation o the divine and human natures in Christ. The bidding is not an alternate one in the litany as Wigram states. https://bethkokheh.assyrianchurch.org/wp-content/uploads/2016/04/1Mar_Aprem_Mooken.jpg 373 745 Church of Beth Kokheh Journal https://bethkokheh.assyrianchurch.org/wp-content/uploads/2016/04/logo-1-e1461136150157.png Church of Beth Kokheh Journal2016-04-09 08:46:062016-04-09 08:47:58Is the Theology of the Assyrian Church Nestorian?